Martin Scorsese's acclaimed family film will debut on Blu-ray and Blu-ray 3D at the end of February. In an early announcement to retailers, Paramount is preparing 'Hugo' and 'Hugo - 3D' for a a release on February 28. Recipient of more Academy Award nominations than any other film, 'Hugo' was honored with 11 total—including Best Picture and Best Director—and has already won Martin Scorsese the Golden Globe for Best Director, was named the best film of 2011 by the National Board of Review, and was cited by more than 150 critics as one of the top 10 films of the year including writers for Associated Press, New York Times, Rolling Stone, Time, Entertainment Weekly, New Yorker, New York Daily News and The Hollywood Reporter, among others. Called “magical and enchanting” (Roger Ebert, Chicago Sun Times) and “one of the wonders of the world you need to see” (David Edelstein, New York Magazine), 'Hugo' is bursting with dynamic action, sumptuous imagery and a heartwarming and magical story that audiences of all ages can enjoy. Welcome to a magical world of spectacular adventure! When wily and resourceful Hugo discovers a secret left by his father, he unlocks a mystery and embarks on a quest that will transform those around him and lead to a safe and loving place he can call home. Academy Award-winning filmmaker Martin Scorsese invites you to experience a thrilling journey that critics are calling “the stuff dreams are made of.” (Peter Travers, Rolling Stone). The Blu-ray/DVD/Ultraviolet Digital Copy combo packs will feature 1080p video, a DTS-HD Master Audio 7.1 soundtrack, and supplements include five featurettes: Shoot the Moon, The Cinemagician: Georges Méliès, The Mechanical Man at the Heart of Hugo, Big Effects - Small Scale, Sacha Baron Cohen: Role of a Lifetime. Suggested list price for the Blu-ray $44.99 and the Blu-ray 3D is $54.99. 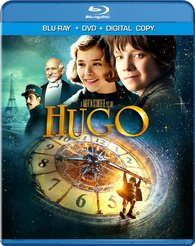 You can find the latest specs for 'Hugo' linked from our Blu-ray Release Schedule, where it's indexed under February 28.